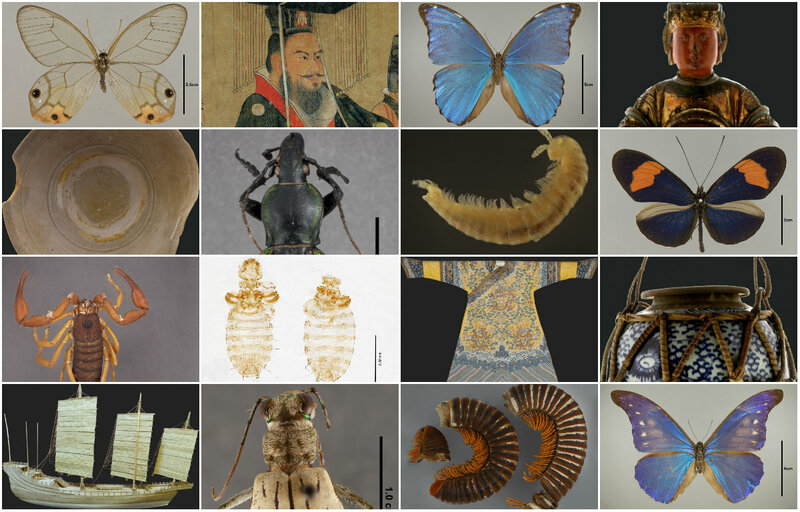 Just a small sample of the Field Museum's digitized artifacts and specimens. Though Chicago’s Field Museum has jumped on the digital bandwagon in recent years, millions of important specimens still remain to be digitally cataloged, while questions of funding linger. To date, less than 3 percent of the Field’s 30 million specimens have been digitally archived – in fact, digitally cataloging the museum’s entirety isn’t even the ultimate goal. So how do they decide what makes the cut? According to Strohmeier, the Field was one of the first to get a grant for digitization efforts, going back to 1992. But in the past several years, an increase in grant money from nonprofits like *The Grainger Foundation and The Andrew Mellon Foundation accounts for the museum’s more recent digital push. For most specimens, being digitally cataloged means that their basic information is added into an online database accessible to researchers. Even fewer get photographed and not all of those photos are created equal. For instance, all of the 400-plus artifacts in the museum’s new permanent collection, the Cyrus Tang Hall of China, have been digitally photographed – some in 3D – and are available to the public online. In the Insects department, the museum’s largest at 12 million specimens, around 4,000 have been digitally photographed. Some of those bugs are so small (many of them only 1-2 mm long) that around 30 separate photos must be taken in order to stitch together a single high-resolution image. The Botany department alone, which is dominated by lots of flat plant specimens that make for easier scanning, is able to catalog upwards of 5,000 specimens per week, according to Field digital media specialist Daniel Le. Photographing specimens actually only accounts for a fraction of the digitization effort – maybe between 10 and 20 percent, Le said. The real work comes from manually entering everything into the online system, a process which takes effort from staff and the museum’s active 154 volunteers in its Collections department. The digitization effort, according to Strohmeier, is ultimately more about public access than preservation. “We have this great store of information here at the institution – however, it really doesn’t do us much good if people can’t access it easily,” he said. But the definition of “easy access” also varies from museum to museum. At Amsterdam’s Rijksmuseum, the public is allowed to download the museum’s digital photos and use them in practically any way they choose. Artworks have been turned into iPhone cases and various other products. Currently, all of the Field’s digital efforts are available for public download on the museum’s website, but website policy mandates that they are requested prior to downloading and they may not be used for commercial purposes, according to Crystal Maier, the Insects collection manager who’s also a coordinator for the museum’s digital effort. The reason the photos can’t be used commercially, according to Maier, is because the museum collects its specimens on permit agreements, meaning the museum promises that it won’t use the artifacts for money-making purposes. “It just wouldn’t be fair to a country to go in, take all of their bugs and leave and then make lots of money off them. It’s to protect them,” she said. In October, the Field raised its admission rates for the third time in five years. Come January, adult Chicago residents will pay $16, with a $22 entrance fee for non-residents. That admission hike comes on the heels of a history of debt, beginning with the museum’s decision to issue $90 million in bonds – a figure it’s since struggled to pay back. The museum wouldn’t release specific figures related to its digitization efforts, nor are those numbers clearly outlined in its recent public annual statements. Strohmeier would only say that funding for about 60 percent of the digital effort comes from government grants, with the rest coming from private donors. Over the past year, the Smithsonian museum network, which maintains some 140 million artifacts, has digitized 15 percent of the 13 million objects slated for such treatment. 140 million object and library collections. In order to accomplish this, the museum uses a kind of digital conveyer-belt, a piece of equipment it rents in order to scan massive quantities of material at a time. Günter Waibel, director of the Smithsonian’s digital office, estimates that by using the conveyer-belt system the museum was able to digitally scan its entire 260,000 item numismatics collection in a time span of three to four months for less than $1 per scan. So would something that like be a good fit for the Field, with a specimen library in the tens of millions? According to Maier, that kind of machine is good for scanning whole drawers of items – but not necessarily the kind of individual scans the Field is interested in. But she also acknowledges that money is an issue. Though close to 4,000 insects have been digitally cataloged over the past two years via a Grainger grant, that money runs out at the end of December. And of the museum’s 6,000 rove beetles – including the one discovered by Darwin – only 2,000 have been cataloged to date. *Correction: The article has been updated to reflect it was The Grainger Foundation, not W.W. Grainger, Inc. that contributed grants to the museum.